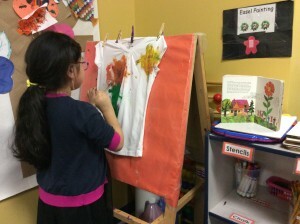 Sesame Sprout Preschool aims to prepare students to live successful, healthy and productive lives. We work to prepare them for later success in school and the larger diverse world community which awaits them. We work to build strong intellectual, emotional and social foundations for our students, never losing sight of supporting their joyfulness, creativity, spontaneity and love of learning. We dedicate ourselves to high quality developmentally-appropriate practices, individualization, nurturance, supporting the development of each student’s full potential, building competence and self-esteem in children, promoting pro-social skills and an appreciation of diversity. We work collaboratively with families and strive to ensure that our interventions meet the highest standards of professionalism and accountability.